PLQ05 Polyester high build base primer is a cream-coloured sprayable base primer for plugs and patterns. Its high build properties are ideal for priming rough or uneven surfaces, providing a solid base for PLQ02 high gloss lacquer. Due to the filler content and low viscosity, a sediment may occur on standing. PLQ05 Polyester high build base primer should be mixed thoroughly prior to use. 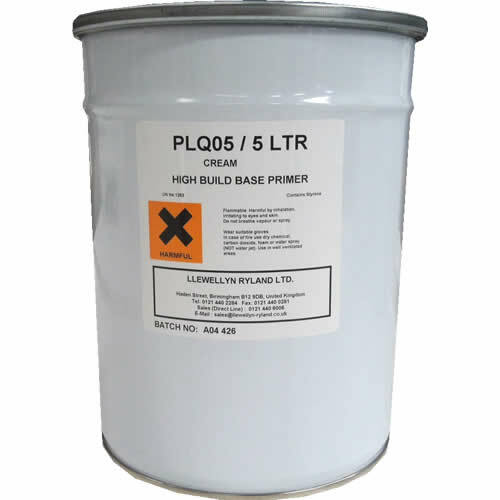 PLQ05 Polyester high build base primer is supplied in a ready-la-spray viscosity. However, if solvent is lost through the re-mixing process, small amounts of Ethyl Acetate, Acetone or Methylethylketone peroxide (MEKP) at : ≥5% may be added. PLQ05 Polyester high build base primer is designed as a primer system for most substrates. However, some absorbent substrates may need the application of Llewellyn Ryland Polyester PLQ01 Safeseal sealant prior to application of the primer. Whilst not always necessary, best adhesion to the surface by the primer is achieved by abrading the substrate with 80-120 grit paper. Alternatively PLQ01 Safeseal can be used to seal the surface, in which case no abrasion of the substrate is necessary. Before application of the primer, ALWAYS remove dust and grease by wiping the substrate with solvent. This practice is not necessary when using PL001 Safeseal if the primer is being sprayed whilst the sealer is still tacky. Due to the filler content and low viscosity of the primer a sediment may occur; for best results, re-disperse the primer with a mechanical mixer. It is important even if only a small quantity is to be decanted from the tin that the whole tin is fully re-dispersed. This procedure must be performed each time the primer is used, Failure to comply with the re-dispersing procedure may lead to application and sanding problems which ultimately jeopardise the overall quality of the finished article.